Cypress Cove Publishing, 9780970586872, 102pp. 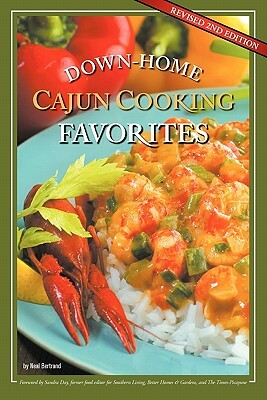 Down-Home Cajun Cooking Favorites takes you into the kitchens of some of south Louisiana's best home cooks. It features 140 of the most popular dishes from Cajun country, carefully selected to give a well-rounded sampling of the flavors of the region. It is a collection of classic recipes from moms and dads, aunts and uncles, ma-moms and pa-pops from the south Louisiana region called Acadiana, or Cajun Country. These popular recipes were contributed by down-home folks who are tremendous cooks in their own right, who learned how to cook these dishes passed down from generation to generation. You'll find Boudin and Cracklins, Boiled Crawfish and Crawfish Etouffee, Stuffed Shrimp, Tasso, Candied Yams, Corn Maque Choux, Smothered Okra & Tomatoes, Stuffed Baked Eggplant or Mirlitons, Bouillabaisse, Chicken & Sausage Gumbo, as well as a variety of sauce piquantes, fricassees, stews, casseroles, appetizers, desserts, dressings, breads, and breakfast dishes like couche-couche and pain perdu. Written in clear, easy-to-follow steps, these mouth-watering dishes are waiting for you and your family. Go ahead, try them, and you, too, will cook like a Cajun.